This year, we’ve written extensively about the effects of badvertising. We launched an interactive quiz to help companies determine if their agency is taking advantage of them, shared horror stories from the front lines of digital marketing, and also explored the economic origins of this advertising trend. 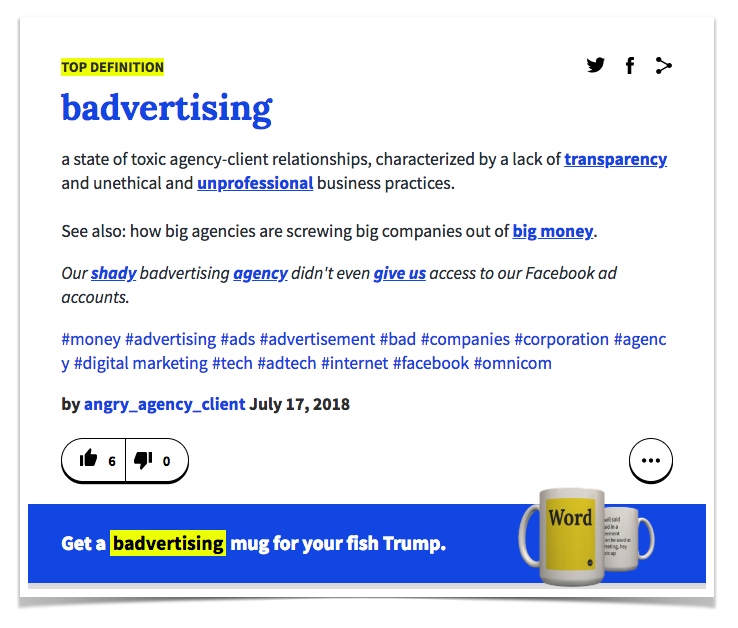 Not to mention, our definition of badvertising has been voted up as the current top listing on Urban Dictionary. For our next exploration, it’s time get even more granular. Because this is a complex issue. And based on our experience, there are two main categories of badvertising. We’re going to break them down, along with some case studies of how they play out on a day to day basis. This first type of badvertising is perpetrated by either agencies that are trying to cover their asses around unethical work they know they are doing, or perpetrated by ad tech platforms in the programmatic display world that purposefully do not have transparent systems to allow clients to see how dollars are being spent. It may take the form of locking clients out of actual ad accounts, obscuring billing, and so on. For example, auto toggling bids is a technology that just raises and lowers bids in a way that's not strategic, but it makes it look like someone is working hard on the account. A few notable examples come to mind. Criteo, a retargeting company, had an undisclosed relationship with a notorious adware company. They were sued for regularly injecting adware into users' personal computers and placing ad inventory on numerous shady websites with suspicious traffic, solely to drive up its click numbers. Uber, the ride sharing company, filed a $40m lawsuit against Fetch Media., a mobile ad agency. They claimed the firm improperly billed them for fake online ads and took credit for app downloads it had nothing to do with. 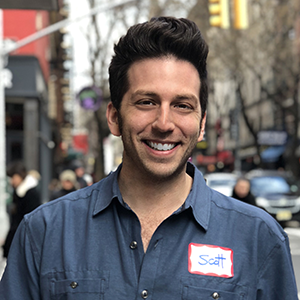 Around the same time, Fetch’s global head of media, Steve Hobbs, told Adweek that a significant amount of downloads in Fetch’s system are flagged as suspicious, saying that, where there’s money, there is fraud. This first type of badvertising is illegal. It happens more than you might think. Unfortunately, it’s not illegal to do your job poorly. Nobody ever got arrested for doing a half assed job at performance marketing. And that’s precisely why this second form of badvertising is so rampant in the digital marketing industry. It has a negative effect on everyone from agencies to brands to investors to consumers. A common expression of this category is hiring the wrong people for the job. An agency might hire juniors who are a few months out of college and ask them to execute senior level work, meaning, managing accounts that require deep domain knowledge and technical acumen. Happens all the time. There are marketers running campaigns that they have no business doing so. Bad work also takes the form of agencies who sell the services for which they don’t have strong or even mediocre capabilities. This happens quite a bit in the Big Five Agency world (Publicis, Interpublic, Omnicom, WPP, Dentsu-Aegis), where large ad agencies often claim to specialize in services they don’t actually know how to fill. And this ends up wasting a ton of client time money. In short, people are faking it until they make it, except they never actually make it. A common example is when an agency lets their Adwords internal growth team build accounts that are fully automatic. Doing so might seem efficient in the short term, but this strategy will ultimately result in the client’s account going off the rails. Meanwhile, the manager will be clueless about what is actually being done. Another story that actually happened to us was at a conference when another ad agency was bragging about their high digital spend for essentially shoddy work, and sitting around the table laughing about how they blew $6,000,000 on ads, but didn’t know where those ads even showed up. That’s bad work, and that’s badvertising. Now, if you suspect that your company might be a victim of either type badvertising (ad fraud or bad work), know this. You’re not alone, it’s not too late to hold your marketing agency or programmatic vendor accountable. One of the services we provide is assisting with diligence. If you’d like to learn more about Metric conducting a deep audit of your current digital marketing efforts and opportunities, let’s talk. We’ve audited hundreds and hundreds of companies, many of whom have been the victims of badvertising. And we’d be delighted to help you diagnose opportunity for scale and efficiency improvements. Donald Trump’s Facebook Ads: Who He’s Targeting Right Now (Part 1) When I first saw Donald Trump’s ad, I felt compelled to reverse engineer his targeting and see what he was up to, and why that matters to the modern digital marketer Badvertising: Our New Book About How Big Agencies Are Screwing Big Companies Out of Big Money, And How to Stop It Something is broken in the digital marketing world, and we're tired of losing sleep over it. That's why we coined a term for it and wrote a book about it. Download your free chapter now. Your Performance Marketing Ads Should Aim for Conversion, Not Admiration While the fundamental principles behind developing creative are still essential, the definition of what effective creative means to performance marketing goes beyond the traditional advertising mindset.